Pilgrims to the outlet center say the journey connects them not only with the many moms they shop side by side with but with the generations before who bought their husbands a nice polo shirt for something like 30 percent off at Nautica factory store. 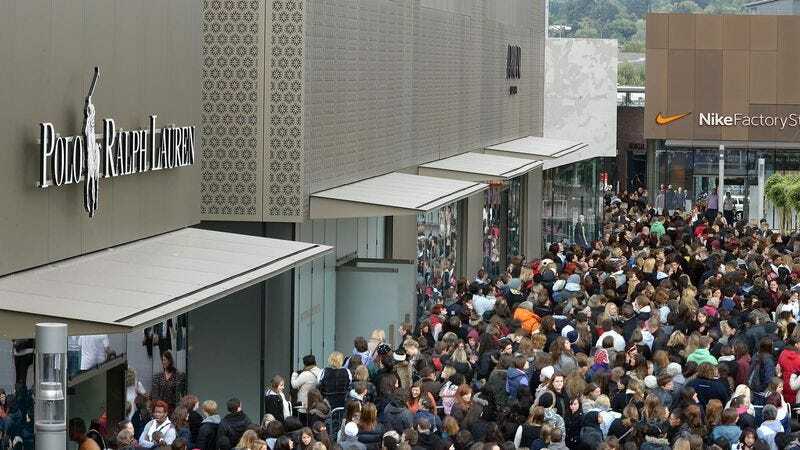 CENTRAL VALLEY, NY—According to reports from across the country, millions of moms set out Saturday morning on a mass pilgrimage to the premium outlet center, following in the footsteps of mothers before them who for ages have participated in the same sacred rite. The moms, many of whom undertook arduous journeys of more than two hours, reportedly sought to attain discounts of up to 65 percent on name-brand fashions and accessories, braving the teeming throngs of fellow pilgrims who inevitably overwhelmed the parking garages and landscaped pedestrian walkways of the venerated site. Clad in the traditional pilgrim’s garb of comfort-fit jeans, a light jacket, and Aerosoles slip-ons, a sea of mothers—who timed their journeys to coincide with annual Columbus Day weekend sales—reportedly swarmed in front of the outlet center’s directory and performed ceremonial invocations, reciting the names and map coordinates of the retailers they wished to visit. Sources said that in keeping with tradition, the amassed moms then congregated around a scarf in a Burberry window display and chanted, “Oh, that’s cute,” before continuing on to the Nike Factory Store, Last Call by Neiman Marcus, and Zwilling J.A. Henckels. According to witnesses, most of the pilgrims only paused in their spiritual quest to partake in the modest meal of a small, no-topping Pinkberry cup or to make their way down the narrow thoroughfare between the Clarins and Ferragamo stores to where the “nice bathrooms” are. Soon after their arrival, reports confirmed, mothers were already bedecked in a variety of shopping bags from the outlet center’s more than 200 holy sites, and as the day wore on, many within the swelling, overheated crowds could be seen removing their windbreakers and tying them around their waists. Sources told reporters that due to the massive influx of mothers, the site perennially suffers from overcrowding, as evidenced by the significant wait time required to purchase decaf hazelnut coffee at the Pret a Manger. In addition, they said, pilgrims routinely require medical assistance, especially elderly grandmothers who are in poor health but have nonetheless devoted themselves to purchasing early Christmas presents at the Samsonite and Yankee Candle stores. “This has reaffirmed my faith in designer labels, which I truly believe are available to anyone willing to endure hardships and make sacrifices for them,” she added. At press time, reports confirmed that more than 300 mothers had been crushed in a stampede after the North Face suddenly marked down all its fur-lined winter coats to half price.